"I'm not sure. Could it be crying?" "Nah! It can't be. It must be those cats fighting outside again." Our kids are 9 and 4. They, thankfully, no longer wake us up by crying and demanding to nurse. See? This is a very odd thing for parents who have slept through the night for several years in a row. We've repressed all of those other, ugly memories. So we had to deal with that. Twice. And we all didn't sleep well the night before due to a large thunderstorm system that moved through around 3 am. Tired, so tired. 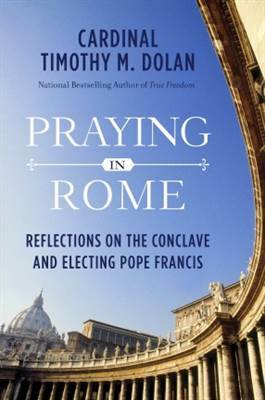 At any rate, Praying in Rome: Reflections on the Conclave and Electing Pope Francis, by our very own Cardinal Timothy Dolan! I first heard of Cardinal Dolan back when he was Monsignor Dolan and was the rector at the North American College in Rome, via my reading of The New Men: Inside the Vatican's Elite School for American Priests, by Brian Murphy. That is also a great book, with very touching and personal stories of seminarians preparing for the priesthood. The then Monsignor Dolan's role as their mentor and guide through their studies and spiritual preparation, and his humorous and down-to-earth approach to these things, always stayed with me. I remember his appointment as Bishop and return to the United States, and I was thrilled when he was named the Archbishop of New York. "Well, I was going about my usual weekday routine. So, I got up early, because I like to pray before I get down to my New Year's resolution of running on the treadmill each day, but then my phone rang..."
This is a quick read. I read it in just a few sittings. And at $1.99 for Kindle, it's well worth it. He makes you feel as if you are there with him, caught up in the excitement and rush of energy that came with this big announcement, and the expectation of the Conclave. Once he gets to Rome, obviously he cannot reveal any details about what happened behind the closed doors of the Conclave. While I am a nosy little thing and was *dying* for more details, I understood why he had to be careful about what he wrote in that section. But the details that he did provide were very sweet and personal. For example, he writes about the first time he met Jorge Bergoglio during the pre-Conclave meetings between the Cardinals, and his impression of him. I really liked this book! It had a journal-like feel to me, as we journey along with Cardinal Dolan for this exciting blur in time. I definitely recommend it, especially at that price. OK, who else has read this, and what did you think?! 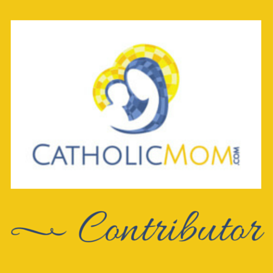 For July, I'm focusing on the Catholic Mom Unleashed Book Club, and so far we are only through two chapters, so still plenty of time to join in if you like! There is tons of chatter in the comments as each weekly post comes out, and I've really been enjoying it. You can also sign up for reminder emails when the chapter posts come out each week, which I took advantage of. Come take a look! I haven't finished Praying in Rome but I'm enjoying it. My favorite part so far was when he mentioned that he was afraid he would run out of peanut butter before the events in Rome finished. I'm not sure what I'd do if I ran out of peanut butter which is what made his comment so memorable to me. I was able to get the ebook from the public library and now I'm off to see if they have the Yarn Harlot book. Melanie, oh I'm so glad! Peanut butter, lol. :0 Yes, isn't it such a funny & cute book? Public library, clutch. And you will LOVE Yarn Harlot. I laughed so hard I snorted! Catherine, solidarity sister, I'm in the same boat with regards to books on my Kindle. ;-) This one is just a quick read though, I think you can justify it that way. :) And that Stephanie, she is my favorite. I love her sense of humor. No, I have not forayed into her YouTube videos, but clearly I need to!